This is my go-to sandwich when I’m feeling too lazy to cook a full dinner but still want something satisfying. 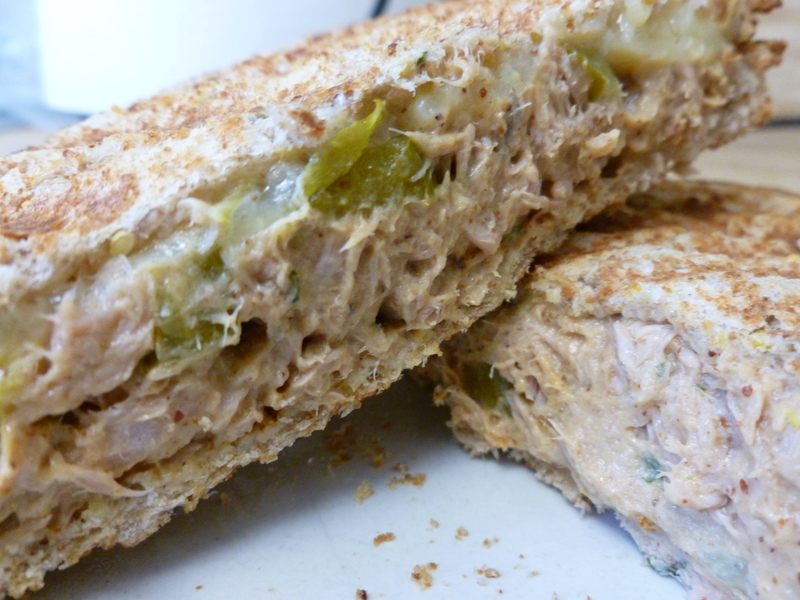 Melted cheddar, zippy jalapeños and tuna on crispy bread…. my mouth is watering just thinking about these sandwiches! This is a pretty versatile recipe- you can omit, substitute, increase or decrease your favorite ingredients based on your personal preferences (we never measure for this– just eyeball it- so all of the measurements below are approximations). This particular iteration is my bf’s latest creation. If you’re using a panini press that requires preheating, start that now so it’s nice and hot when you’ve assembled the sandwiches. 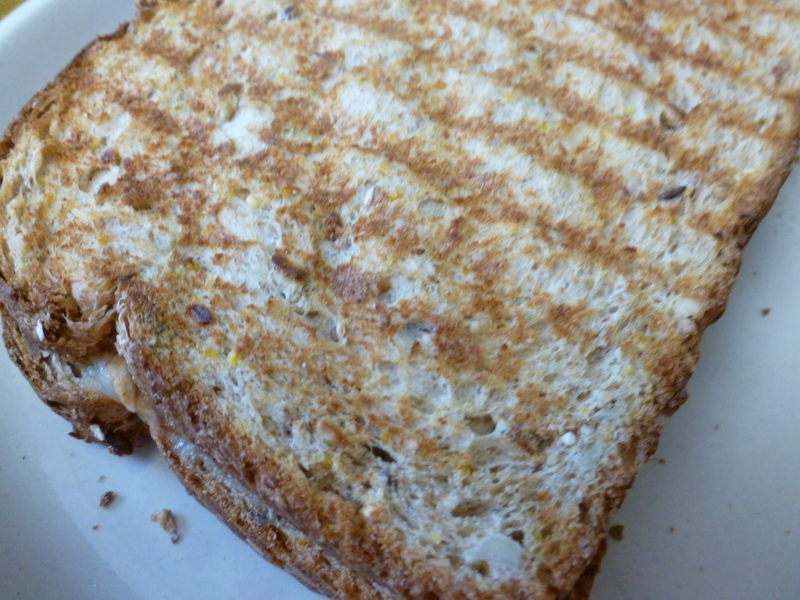 If you don’t have a panini press, you can use a non-stick pan or pan sprayed with non-stick spray on medium-low heat. Open the can of tuna and drain off the excess water. I usually rinse the can before opening, and use the lid to drain off the liquid after opening by pressing the lid against the meat. 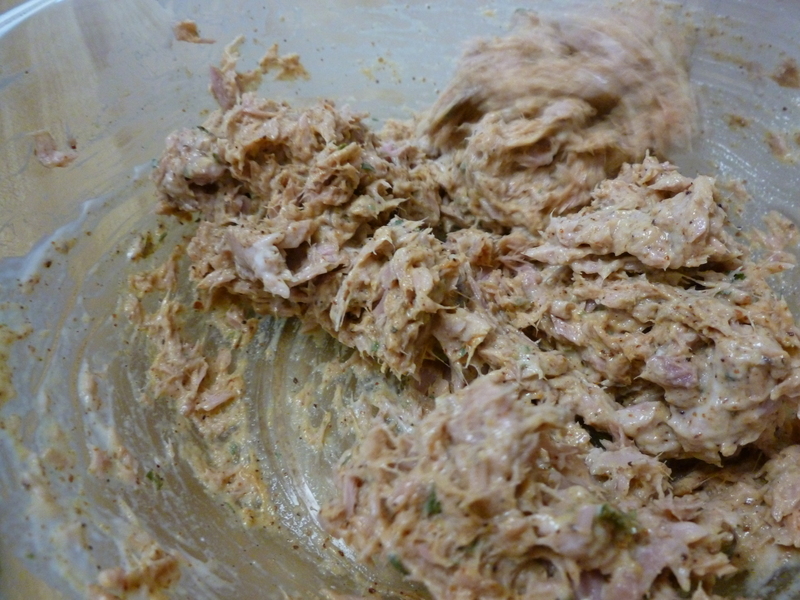 In a medium size bowl, separate the tuna chunks with a fork. 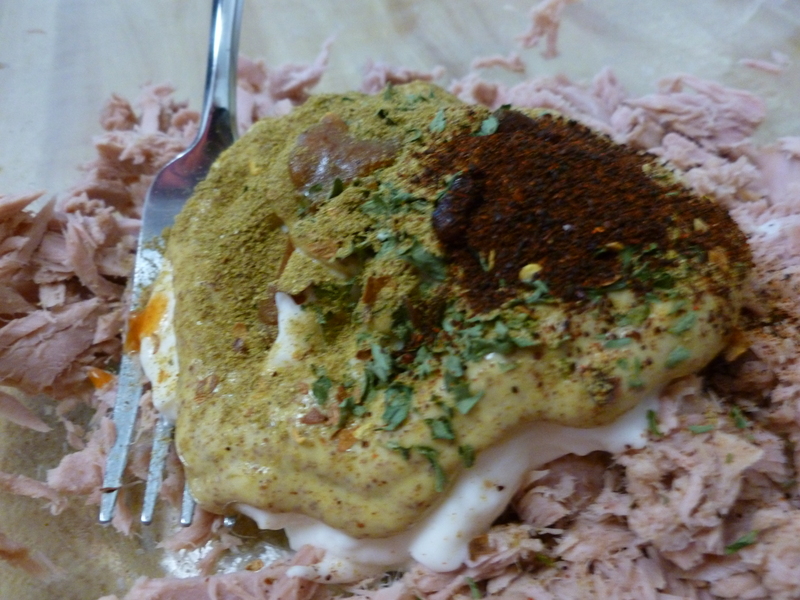 Basically just smush the tuna until it looks like the picture below. Next, add in the globs of Miracle Whip (or mayo). 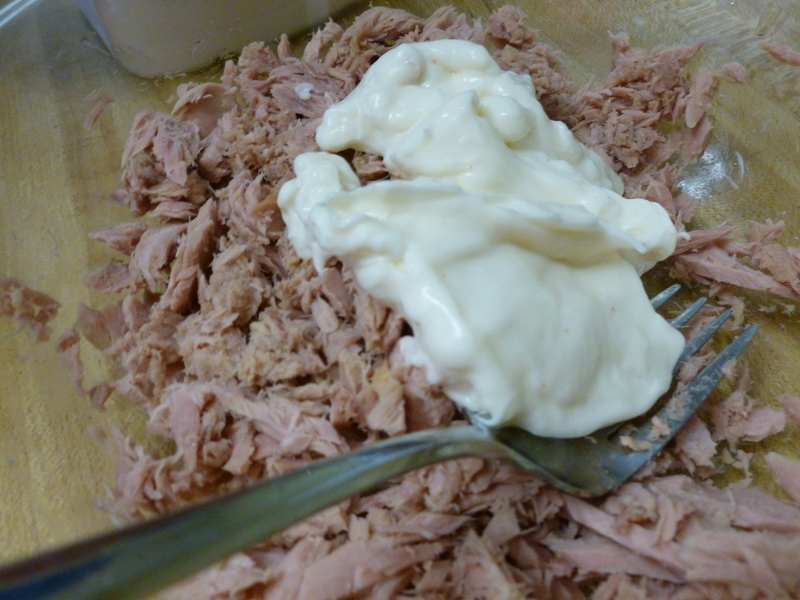 Don’t add too much at this stage- you can always add in more Miracle Whip or mustard if you feel that the tuna is too dry. And the coarse grain mustard. You can spend a lot of money on fancy mustard, but we’ve found that a certain discount store’s house branded coarse grain mustard tastes just as good as some of the expensive mustards I’ve purchased.I also really like Trader Joe’s whole grain mustard. Sprinkle on the spices, dried onions, parsley and pepper. Add a dash of hot sauce if you dare! 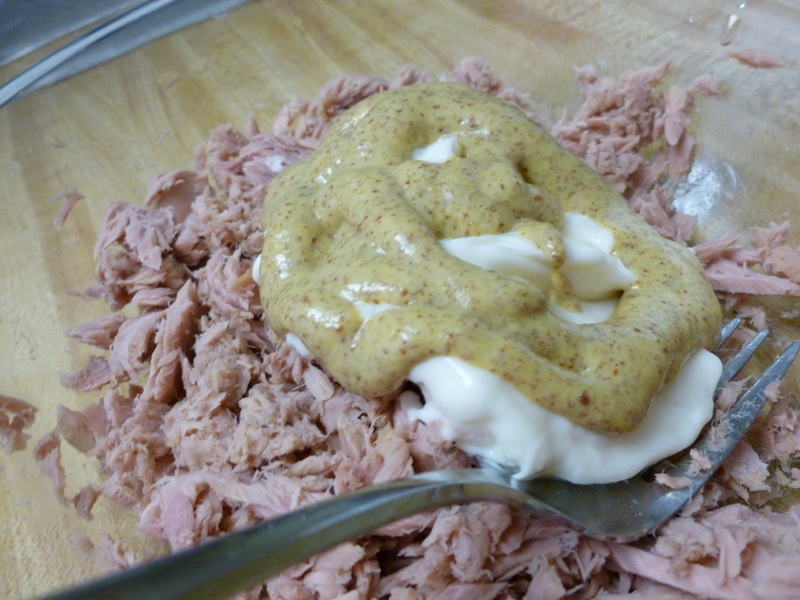 Carefully incorporate the Miracle Whip, mustard and spices into the tuna using a fork or spatula. The mixture should be just moist enough to hold everything together. If you’re using the celery, add it in now. Stir to distribute evenly throughout the mixture. We didn’t use celery this time, but it does add a nice crisp crunch to this sandwich. And the fiber content in the celery will help you keep feeling full after this meal. If you’re making two sandwiches, divide the mixture evenly and spread onto the bread. 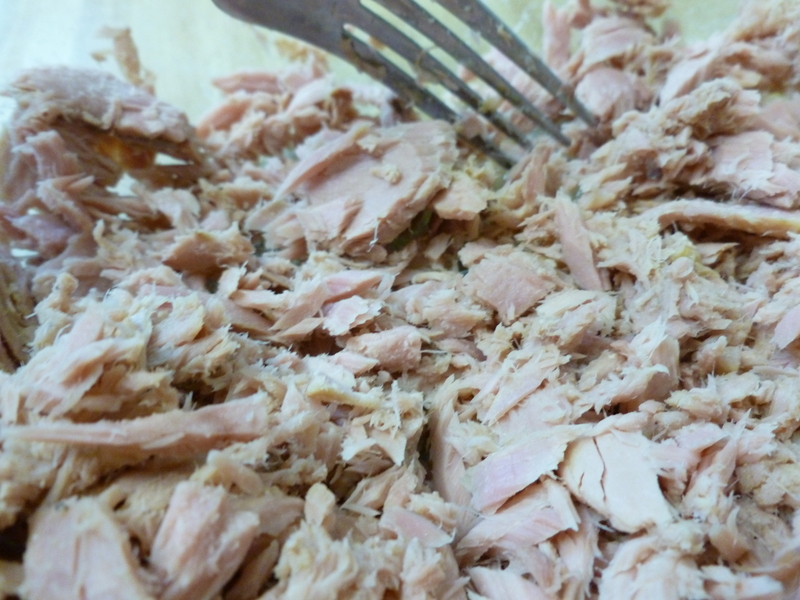 You can also save half of the tuna mix for later (another tasty sandwich or add to a salad for a healthy lunch) or make one huge glorious sandwich if you’re feeling ravenous. 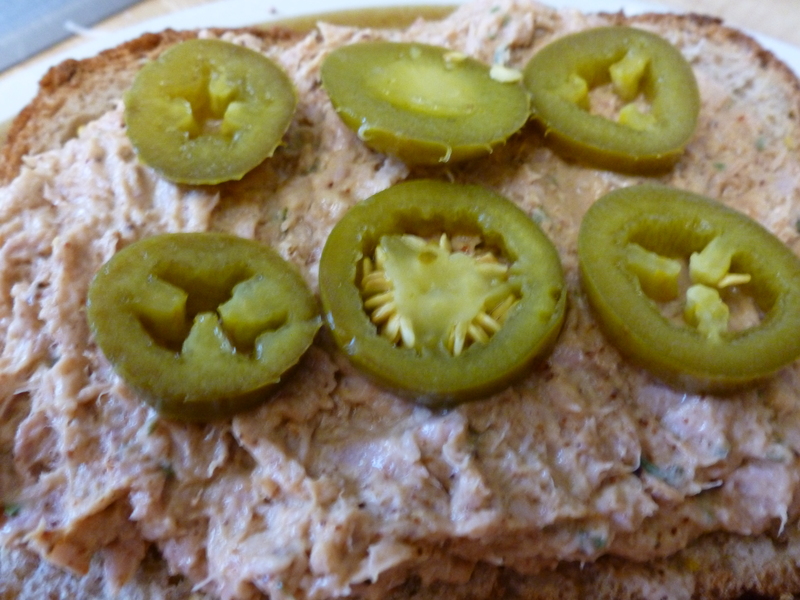 Arrange the sliced pickled jalapeños evenly on each sandwich. 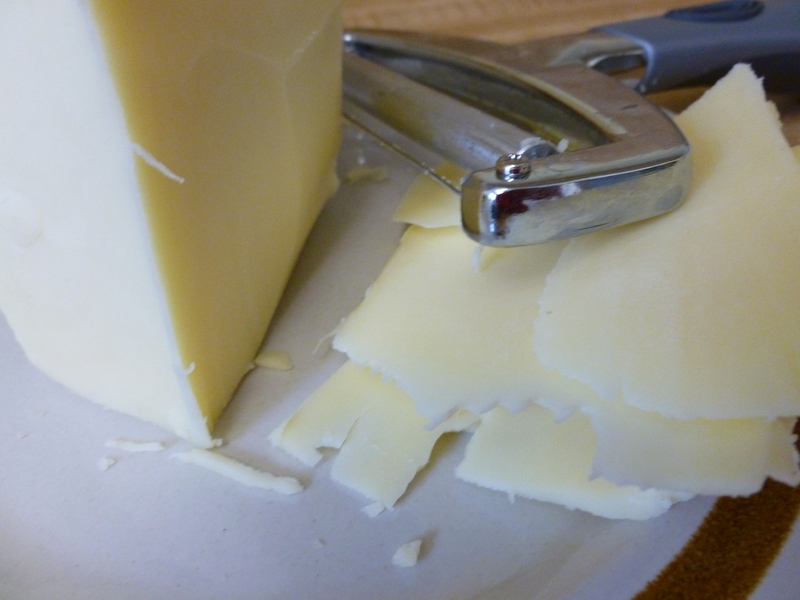 Slice the sharp white cheddar using a cheese cutter (for soft cheeses) or a knife. And distribute evenly across the sandwiches. 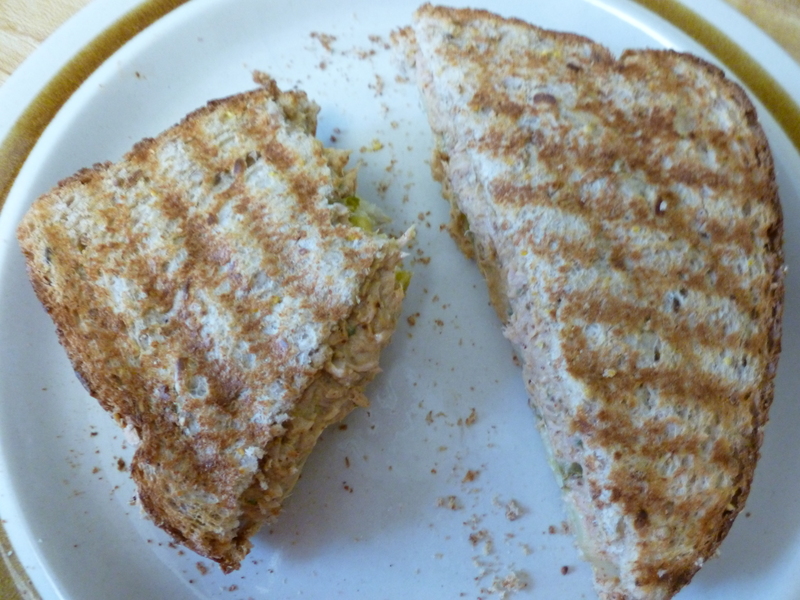 Place the second slice of bread on top and place onto the panini press with the tuna mixture on top (the slice of bread you just added should be on the bottom). I’ve found that this tends to decrease the likelihood that the sandwich will get soggy. 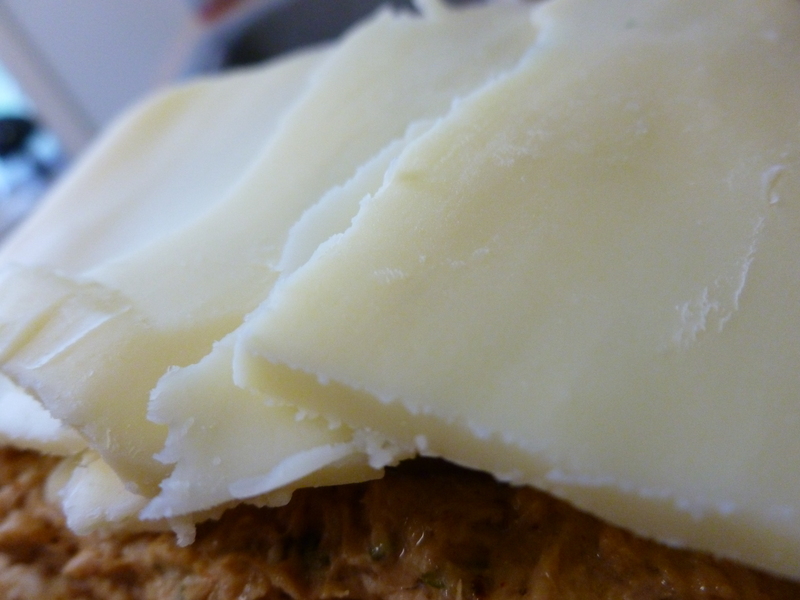 Grill for about 2-3 minutes, then flip over and grill for an additional 1-2 minutes until the cheese is melted. If you are talented enough to be able to flip the sandwich without making a mess, try positioning it at a 45 degree angle from the first grill marks– this will give the bread pretty crosshatched grill marks. I can occasionally do that. Cut the sandwich into halves diagonally (it’s a scientific fact that sandwiches cut diagonally taste better and help you with geometry tests).